I finally had time to get back to Kalamazoo, Michigan's Air Zoo to do some sketching and painting. The museum has given me permission to work inside the barriers that they have around the various aircraft that they have on display. Makes it fun for me because I can get in close to see the details. This is my attempt at the Air Zoo's F6F-5 Hellcat. It's one of the museum's trio of World War II Navy fighters that include the Hellcat, Corsair, and Wildcat fighters. 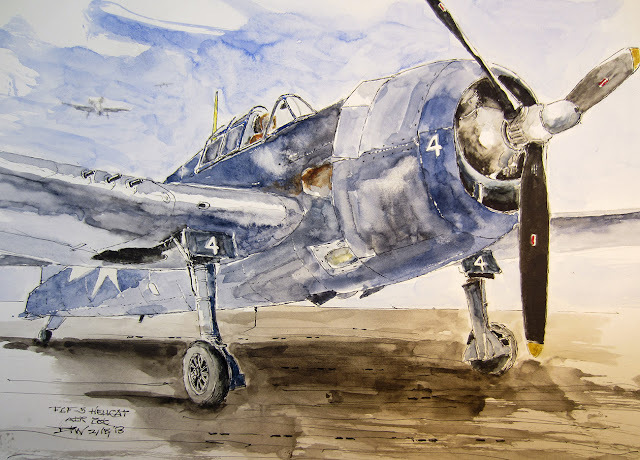 The Hellcat was important to the Navy in the Pacific because it was an aircraft that could maneuver and out maneuver the famous Japanese Zero fighter. A lot of Hellcats were built but few survive. What's neat about this Hellcat and the rest of the museum's trio of fighters is that they are all still flyable. Also neat is each of the fighters has its own mannequin pilot...makes you look twice to see if someone is really in the cockpit! What a beauty, Dave...glad you've gotten to go back to the museum! Thanks Kate. It's been a frustrating winter for my art work. Maybe it is because I cut my teeth drawing cars, but MAN I LOVE THESE. I also love how you let the water color do its thing. What size are these? What paper do you use? James the fighters are done on 90 pound 11 x 14 Strathmore mixed media paper. The paper is spiral bound and has a smooth hot press finish. I prefer the smooth finish because I think the watercolor flows better. Glad you like the Hellcat.